Nothing chills like knowing what you want can only be achieved if you are excluded. The town being described is Noiva do Cordeiro. Translated to English that means Bride of the Lamb. In Portuguese, like Spanish, the same word means girlfriend and bride. This must cause confusion but I am old and I keep my distance. Noiva do Cordeiro is 50 miles from Belo Horizonte in the middle of Brazil. The founder of the town was a woman. Maria Senhorinha de Lima settled there in 1891 after being branded an adulteress in her own town. There is a tradition of strong independent minded women. The town has some men but they leave in the week to work elsewhere. This arrangement also exists in certain towns on the north western coast of Spain and it has produced similar results, communities managed by women. But in Noiva do Cordeiro the women also form a majority of the residents. The men are scarce. The rules are attractive and so are the women. Noiva do Cordeiro is renowned for the beauty of the women. I am not a fan of soap opera but my nails definitely need doing. If that sounds like a sneer, it is not. This week 13 men filmed themselves escaping from a Brazilian prison. 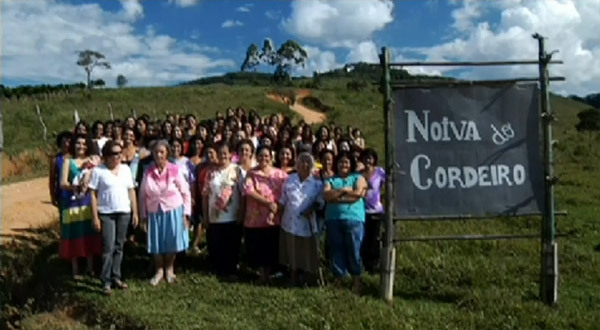 The video footage suggests a cynical narcissism beyond women or at least the women of Noiva do Cordeiro. In another prison, inmates protested against the conditions inside the prison. Four prisoners died, two were beheaded. The man who was found alive in a Brazilian morgue two hours after he was put in a body bag was luckier. Compared to the world of men and the institutional competitiveness that may or may not be authentic, the shared widescreen TV looks increasingly attractive, especially when there are no men to hog the remote control. Call it what you want, Rosalee, but whatever it is it inspires me. Howard Jackson has had 3 books published by Red Rattle Books. His 11,000 mile journey around Brazil is described in Innocent Mosquitoes. His next book is a compilation of horror stories and is called Nightmares Ahead. It will be available in 2015. Posted in Brazil, Innocent Mosquitoes, News, Travel and tagged Brazil, noiva do cordeiro, politics, travel on August 29, 2014 by Howard Jackson.